Astronomers using the Atacama Large Millimeter/submillimeter Array (ALMA) have discovered a surprising connection between a supermassive black hole and the galaxy where it resides. Powerful radio jets from the black hole – which normally suppress star formation – are stimulating the production of cold gas in the galaxy's extended halo of hot gas. This newly identified supply of cold, dense gas could eventually fuel future star birth as well as feed the black hole itself. The researchers used ALMA to study a galaxy at the heart of the Phoenix Cluster, an uncommonly crowded collection of galaxies about 5.7 billion light-years from Earth. The central galaxy in this cluster harbors a supermassive black hole that is in the process of devouring star-forming gas, which fuels a pair of powerful jets that erupt from the black hole in opposite directions into intergalactic space. 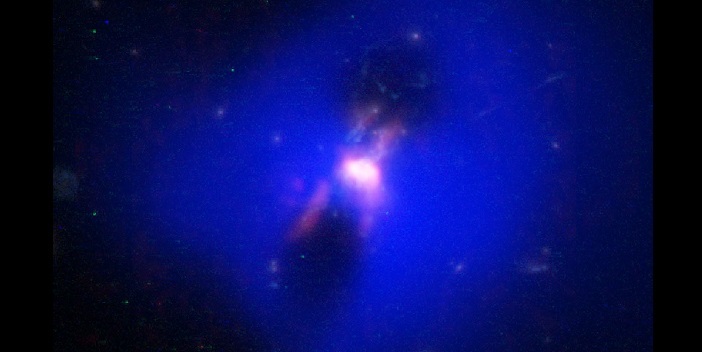 Astronomers refer to this type of black-hole powered system as an active galactic nucleus (AGN). Earlier research with NASA’s Chandra X-ray observatory revealed that the jets from this AGN are carving out a pair of giant "radio bubbles," huge cavities in the hot, diffuse plasma that surrounds the galaxy. These expanding bubbles should create conditions that are too inhospitable for the surrounding hot gas to cool and condense, which are essential steps for future star formation. The latest ALMA observations, however, reveal long filaments of cold molecular gas condensing around the outer edges of the radio bubbles. These filaments extend up to 82,000 light-years from either side of the AGN. They collectively contain enough material to make about 10 billion suns. "With ALMA we can see that there's a direct link between these radio bubbles inflated by the supermassive black hole and the future fuel for galaxy growth," said Helen Russell, an astronomer with the University of Cambridge, UK, and lead author on a paper appearing in the Astrophysical Journal. "This gives us new insights into how a black hole can regulate future star birth and how a galaxy can acquire additional material to fuel an active black hole." The new ALMA observations reveal previously unknown connections between an AGN and the abundance of cold molecular gas that fuels star birth. "To produce powerful jets, black holes must feed on the same material that the galaxy uses to make new stars," said Michael McDonald, an astrophysicist at the Massachusetts Institute of Technology in Cambridge and coauthor on the paper. "This material powers the jets that disrupt the region and quenches star formation. This illustrates how black holes can slow the growth of their host galaxies." Without a significant source of heat, the most massive galaxies in the universe would be forming stars at extreme rates that far exceed observations. Astronomers believe that the heat, in the form of radiation and jets from an actively feeding supermassive black hole, prevents overcooling of the cluster's hot gas atmosphere, suppressing star formation. This story, however, now appears more complex. In the Phoenix Cluster, Russell and her team found an additional process that ties the galaxy and its black hole together. The radio jets that heat the core of the cluster's hot atmosphere also appear to stimulate the production of the cold gas required to sustain the AGN. "That's what makes this result so surprising," said Brian McNamara, an astronomer at the University of Waterloo, Ontario, and co-author on the paper. "This supermassive black hole is regulating the growth of the galaxy by blowing bubbles and heating the gases around it. Remarkably, it also is cooling enough gas to feed itself." This result helps astronomers understand the workings of the cosmic "thermostat" that controls the launching of radio jets from the supermassive black hole. "This could also explain how the most massive black holes were able to both suppress run-away starbursts and regulate the growth of their host galaxies over the past six billion years or so of cosmic history," noted Russell.